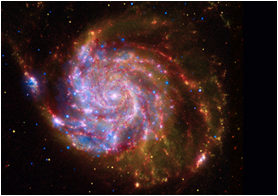 WHO: The 101st object in astronomer Charles Messier's catalog is commonly known as M101 or the Pinwheel Galaxy. WHAT: Like the Milky Way, M101 is a spiral galaxy. The most notable features of these galaxies are the graceful spiral structures arcing out from their centers. WHERE: M101 is located at a distance of about 25 million light years from Earth in the constellation Ursa Major, the "bear." 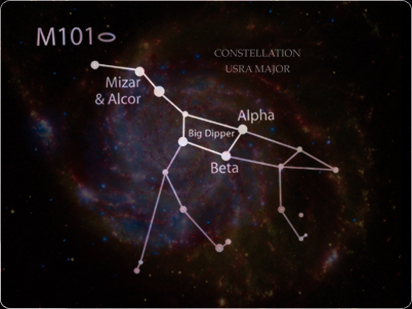 From the ground, M101 can be seen just off the handle of the Big Dipper with a small telescope or binoculars. WHEN: The objects in M101 have a wide variety of ages ranging from newborn stars to globular clusters containing stars that are billions of years old. HOW: X-rays show superheated material throughout M101, while infrared and optical data outline the cooler dust and young stars in the spiral arms of the galaxy. WHY: Since Earth is located within the Milky Way's flat, thin disk, it is impossible for us to see in its entirety. Instead, by observing other spiral galaxies that are oriented "face on" to us, like M101, we can better understand our home galaxy.